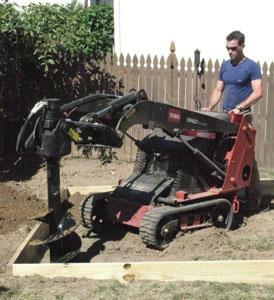 It’s fairly common knowledge that most states require notifying their “dig safe” agency before excavation work (keep in mind “excavation” can be post-holes for a fence or deck as well as larger digs like trenches or a foundation.) Where I live it’s both on-line and on the phone, 811. And it’s free. They even run ads on the radio–good reminders actually. 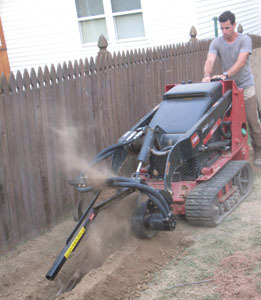 Using the Toro Dingo to trench for electric lines. The good news is that if there is a gas or water line running diagonally across the yard they’ll probably spot it. And if you get to talk the tech who comes out he/she can tell you, generally, what to expect. For example, where I live, water lines have to be a minimum of 36 inches below grade (to prevent freezing of course). Electric needs to be 24 inches and in conduit. Natural gas, however, has no depth code here. I was told the line should be 48 inches deep–should be–but it often isn’t. Also, while in some old houses you’ll find a hard pipe supplying the gas from the street to the house, that system has probably been upgraded to a plastic pipe of some sort–which means who knows how its meandering through the yard and up to the meter? That’s the case on the project I’m working on: The line was curving and only about 2 feet down, which I found with my digging bar. The good news is that the plastic pipe I exposed (I’m building a fence) is super rugged and sustained no damage. The bad news is–keep in mind I knew it was there, just not how deep–was that I had to alter the post footing to maintain layout once I knew what level it was at. Augering for pergola post holes--no utilities in site. Here’s some more reasons to call Dig Safe. You never can tell what’s running where. Also, you create a buffer between you and an emergency repair, if only financial. For example, if our Dig Safe agency misses a line location by more than 18 inches and you puncture it with a back hoe, the emergency fix is on them. If you don’t call, the emergency fix is on you. And you create a paper trail for not only safety but for working safely and properly. Whether you’re a contractor or working on your own house, it all starts and ends there–safety. If you hit a line and smell gas or hear hissing, get out of there and call your gas utility to get it fixed. So before you dig down, pick up the phone and make the right call.